I use this Guacamole Recipe frequently, both at home and the restaurant. 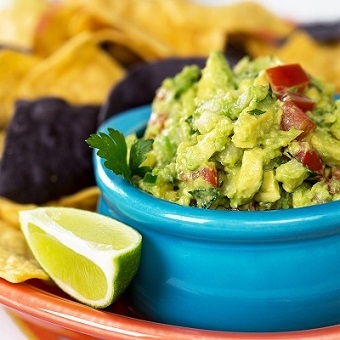 Guacamole has become so popular in most parts of the United States, that people enjoy the dip all year long, not just for celebrating Cinco de Mayo. 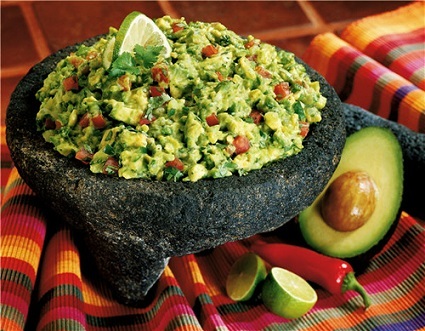 There really are no specific foods associated with Cinco de Mayo (May 5), but guacamole certainly fits the festivities. Guacamole is basically avocado mashed up with a few other ingredients added to it. And there are many, many variations of this recipe. In fact, if you have a good salsa on hand, there is a recipe below that I have used when I need guacamole in a hurry. It saves time and is very good. If you want to serve both a guacamole and a salsa dip, you can make extra salsa and then use some in your guacamole recipe. Avocado has a high fat content and is full of vitamins. Avocado has always been revered for its nutritional value and a good recipe makes for a great way to serve a nutritional dip. This is a healthy eating recipe! Preparation time: 15-20 minutes. Makes about 1 1/2 cups. Preparation time: 5 minutes. Makes about 1 1/4 cups. This recipe assumes you have extra salsa on hand. Ole'. Now that was really easy. Of course this is a delicious guacamole dip and certainly an easy, healthy eating recipe, but only IF you have a very good salsa. Click on Roasted Salsa Recipe. Enjoy your Guacamole Recipe and the company of those you share it with!